If you have never read Sebald, his work almost defies simple description. It must be experienced. Adjectives from admirers abound: mesmerizing, beautiful, subtle, sublime. Long evocative sentences unfold into even longer reflective paragraphs – at times running for pages – enhanced with the insertion of grainy photographs of people, scenery, pages from notebooks, objects, sketches. The reader is pulled in, guided along through landscapes, recollections, side observations and historical reflections by a narrator who is present, patient and human in the face of the incompleteness afforded by memory and the passage of time. 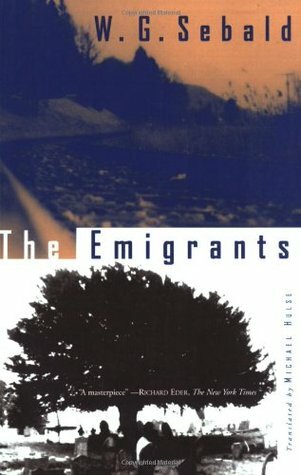 The Emigrants may well be the most accessible of Sebald’s work that I have read, especially because it forms its structure around the apparent biographies of four men who have emigrated or been exiled from their homelands. Three of the four have a Jewish heritage and World War I and II form a critical backdrop to the four very different accounts. Our narrator encounters each of these men, in person, even if only as a child, but in most cases he pieces together part or all of their life histories through the recollections of others, and the diaries and memoirs that he acquires along the way. In some cases he even attempts to revisit the locations that impacted the lives of his subjects, finding only decay or even complete obliteration in his vain efforts to find traces of a past that cannot be revisited. There is such a deep and abiding melancholy that runs through these pages, that I don’t think I could have chosen a better literary companion to mark the passing of this difficult year. But it broke my heart and drove me to tears on more than one occasion. The first two chapters end with suicide. In the first we meet the eccentric Dr Henry Selwyn who, by the time the narrator and his wife come to know him, has taken to dwelling in the garden of the house owned by his wife from whom he is long alienated. He confesses to a greater sense of loss over a friend who had disappeared into the crevice of a glacier years before than any regret for the dissolution of his marriage. A Lithuanian Jew who had sought to conceal his heritage after emigrating England, the gentle doctor would eventually put his hitherto unused rifle to final lethal use. In the second chapter the narrator revisits a beloved childhood teacher, Paul Bereyter, upon hearing of his suicide. Through his own reflections and conversations with a French woman who became Paul’s friend in his later years, an attempt is made to piece together the roots of the melancholy that had been hinted at when Paul was an unconventional but enthusiastic teacher; yet grew with the realization that even being 1/4 Jewish was sufficient to make him an exile in his own country. Meticulous and pragmatic to the end, the former teacher carefully researches his decision to end his own life. But although you know it is coming, the recounting of Paul’s final day is none the less devastating for the reader. The narrator then traces the history of his own great-uncle Ambros Adelwarth in the third section. I found this portrait at once the most moving and the most devastating. Here the emigrant destination is North America and, for a change we are in settings with which I have some connection. Eccentric and meticulous in presentation and decorum, Ambros rises quickly in the hotel industry of the early 1900s and, once he joins his siblings in the US, secures works with a wealthy Jewish family on Long Island. He is given charge for their son Cosmo, a young man driven to reckless excess and, as we will also see, its dark counterpart so recognizable to those of who are bipolar. Ambros and Cosmo embark on a tour of Europe and the Middle East, marked by gambling, daring aerobatic performances and a certain display of personal affection that raises the eyebrows of the elite that inhabit the rarefied world of wealth and glamour in the years just before the First World War. With the outset of war though, Cosmo begins to plummet into despair and despite the best remedies that money and contemporary mental health care can buy, he will end his days in a private sanatorium. After staying on and looking after the family, Ambros retires to live in quiet isolation. But he is seemingly haunted by a deep unbearable grief. Suicide would be too messy, one imagines, for a man who dresses and presents himself as a formal gentleman to his dying day. Rather Ambros opts for voluntary commitment to the same sanatorium where Cosmo died, stoically submitting to an extreme regime of ECT as if the only way to truly destroy traumatic memory is through one bone blasting jolt at a time. The final chapter, one which Sebald admitted was based on the amalgam of a landlord he once had and a well known artist; finds our narrator in Manchester, England. The city centre is in rapid decline. Here he meets Max Feber, an artist who, having emigrated from Germany, has for decades been single-minded in his efforts to find refuge through art. He devotes himself to this task seven days a week, drawing and erasing his work repeatedly, beyond the patience of his models. The narrator is curiously drawn to this anti-social, unusual character and they form an odd friendship but it is not until he revisits Max 25 years later that he realizes that there is here another story of loss to be fleshed out. But the lasting impression of the emigrant experience is as one in which both the realities from which emigrant has come and those to which he arrived (in this case in Germany and in Manchester) are both subject to decay, dissolution and the vagaries of memory and time. I have never been one for family history. My mother’s family emigrated from Ireland to Brooklyn, New York in the mid 1800s, my father’s mother’s family would have arrived in Toronto from England probably around the turn of the 20th century whereas his father’s family were United Empire Loyalists, making him a 7th generation Canadian. My parents met in New York City in the late 1950s, an era to which my father repeatedly tried to return long after it had ceased to exist. My brother and I were born in New Jersey but, after exploring a variety of options, my family pulled up stakes and moved to western Canada away from everyone they knew and settled here when I was only a few years old, soon adding another son. Apart from that rough sketch, I am not inclined to family trees, I have only two photos of myself as a child and by the time my own children were born I had developed such a strong aversion to having my picture taken that I sometimes worry that I may have failed to take enough photos of my own children when they were growing up. Many years ago I finally understood why the person I saw in pictures or in the mirror was so at odds with the person I knew myself to be and started on a journey to correct the discord. Having reached my intended destination I no longer know how I fit into my family tree. In a very fundamental way I am an emigrant who has become exiled in his own life, still seeking to define what that means for me. As the richly imagined portraits in The Emigrants illustrate there is a melancholy, anxiety and despair that can haunt the emigrant experience. I found myself wondering about origin, that is, how much of the melancholy was carried into the experience and how much owed its origin to dislocation and loss? As a person with bipolar disorder recovering a from a serious breakdown, questions of cause and effect always simmer. In the end it is impossible to distinguish loss leading to despair from despair that enhances a sense of loss. Having experienced both this past year I enter 2015 with a cautious mix of anxiety and anticipation. I wish that tree had a friend. Haven’t read Sebald *adds to list*. Just finished reading The Tattoo Artist – Jill Ciment – heartbreaking and breathtaking. Glad you sorted the discord, lovely man. As for 2015 … hahaha fucknose. 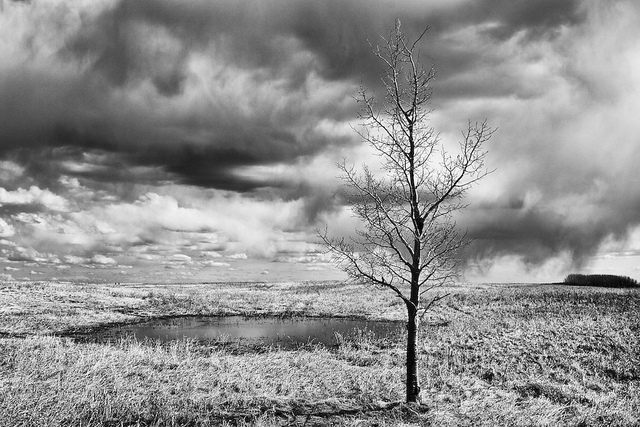 I love that solitary tree. I have photographed it many times. As for 2015, my biggest concern is income. I do feel much better but I don’t know how I will know when I will be ready to work without going crazy again. There is a sense that I am not there yet but I may not have a choice. Sounds familiar and I’m freaking terrified of even trying to find work. I just ordered Sebald’s book since I’ve enjoyed several other books you’ve recommended immensely. Here is hope for a better year for us all! I too spent New Year’s Eve reading (while enjoying champagne). 2014 was a rough year for me and finding your wonderful blog was actually one of my highlights. I do hope this year is an easier one for you. Thank you for your kind words. Hope you enjoy spending time with Sebald. Best to you for 2015. Thank you for your kind comments. This book is a treasure. I had a look at your site and subscribed. I am fascinated by the places you have lived and the have a growing interest in literature from the countries you focus on. Glad to meet you! Previous Previous post: This Is Paradise, or where does fiction meet real life?